Obituary of Miss Minnie Jowett. 1915-2009. As it appeared in the Parish Magazine July 2009.It was with great sadness that we learnt of the death of Miss Minne Jowett aged 93years [b.1915]. She was a much respected and loved person in Grewelthorpe and throughout the area.Born in Grewelthorpe, she attended the village school, where her musical talent was spotted and she was encouraged to study the organ as a pupil of Dr. Moody of Ripon Cathedral. She started playing as deputy organist for service in Grewelthorpe Church at the age of 15. She provided wonderful church music as organist at St. James’s Church from 1935 – 2003, over 68 years.Having decided on a teaching career she trained at Ripon Teacher Training College, where she was also organist. friendships made whilst at the college were maintained throughout the years, as Minnie organised an annual get together until she moved into the Coach House Nursing Home in 2006.Following a number of teaching posts, she returned to teach at Grewelthorpe School and was headmistress from 1947-1975. She was a dedicated teacher and continued her interest in all her pupils over the years, sharing their joys and disappointments, and playing the organ for their weddings and other family occasions.Together with her sister Mary, she travelled the world and had many interests and friends: she was a member of the Ripon Lunch Club, the Highside Singers, W.I. Fearby & Healey Concert Party and Grewelthorpe Folk dancing team. [see other pages on this site]. In all Minnie did, however she will be best remembered for her truly wonderful Christian example. Grewelthorpe Folk Dancers. Minnie front left. 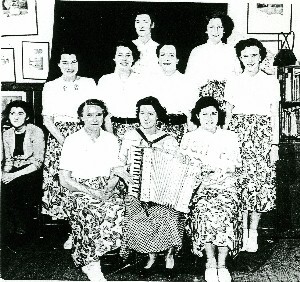 Her sister Mary is standing far right. BEATRIX JANE JOWETT. 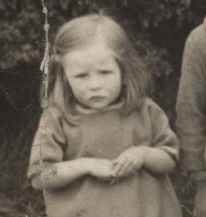 Born 28.7.1913. of Minnie born 1879. Sister of Minnie & Mary. In 1938 she was made assistant teacher at the school. Married in 1945. to Hynck Vesely. and lived East Keswick. ELIZABETH JOWETT. Born C1838. Buried Mickley 20.5.1923. MARY WHITLEY JOWETT. Born 7.4.1923. Died 24.3.2008.Sister of Minnie and Beatrix. Lived at Wrose, Grewelthorpe.Worked at Nat West bank in Ripon. See Keith Whitfields’s memories under the Notices section of this web site.It was reported in the Yorkshire Evening Post January 1931 that Mary had won a prize in a children’s colouring competition. She had won 2/6d. MATTHEW JOWETT. Born 1827 Rigton. Son of William of Killinghall. Married Ann of Rigton. MINNIE JOWETT. Born 17 Aug 1879. Married to William of Shipley. Mother of Beatrice, Mary & Minnie. In 1939 she was a widow living at Wrose in Grewelthorpe. MINNIE R. JOWETT. Born 15 Nov 1915. Dau of William & Minnie. see obit above. WILLIAM JOWETT. Born C1791 Killinghall. Married to Elizabeth of Pateley Bridge. A widower in 1861 in Rigton. WILLIAM JOWETT. Born C1860 Rigton. Son of Matthew & Ann. In 1881 he was a farm servant at Harrison’s farm Bramley Grange. Grewelthorpe. WILLIAM JOWETT. Born C.1878 Wrose Hill, Shipley. In 1911 he was unmarried a Farmer & Grazier in Grewelthorpe. Ad in Yorks Post Feb 1913. Death of William Jowett Yorks Post 1933. ROPER ROBERT JOWETT. In 1914 lived The Green Grewelthorpe. Father of William.